The Northern Irish artist, illustrator and writer Oliver Jeffers is a little bit of a polymath with a wry, endearing take on modern life. For his latest insightful pieces—mainly sculptural and collage work from the past decade—head to Lazinc gallery in London’s Mayfair which is hosting his largest UK solo show to date (Observations on Modern Life, until 15 May). His new globe structures, emblazoned with statements such as “People live here”—give Brexit a new dimension. “By making environmental, apolitical and sometimes humorous comments on maps and globes, I have been addressing issues I feel strongly about regarding how random maps are in the first place, how arbitrary the carving up of things and drawing of borders are,” Jeffers told GQ. Another work depicts Buck Alec in a dress, the late Belfast bare-knuckle boxer who kept defanged lions. 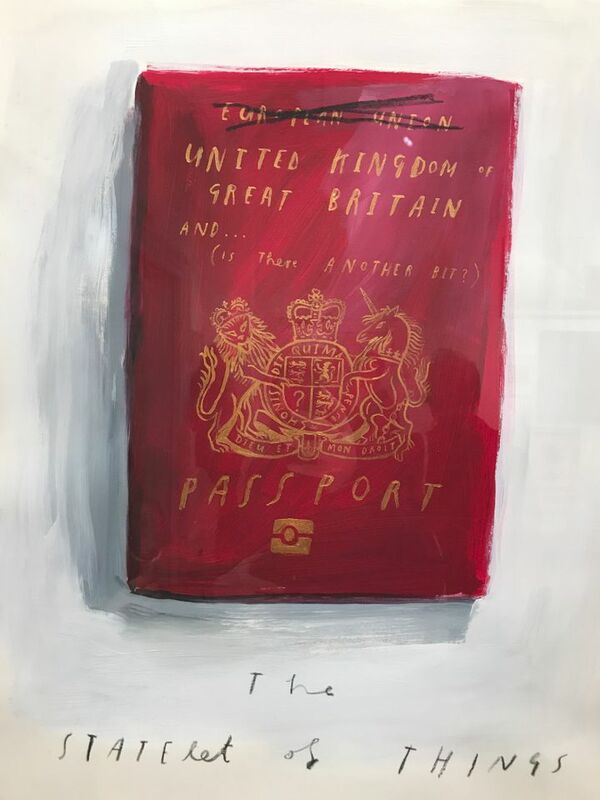 But the most prescient and potent piece is a defaced UK passport with the words European Union scrubbed out (The Statelet of Things, 2019). The EU has indeed been removed from British passport covers, giving Jeffers’s astute take on the state of things extra resonance in these turbulent times.